I was invited to a De Martino tasting by the awesome people over at www.corkd.com (thank you!) and got to try 5 of their fabulous wines. I gave every wine over 90 points, all were very well made. The best part? The average bottle was $14.99! Chile had a great 2007 vintage so if you see any Chilean wines (especially Cabernet) from ’07, pick up a bottle and give it a try! These wines are delicious – in my opinion, of course. They are bold, fruit forward and peppery with softer tannins on the finish. If you are scared of peppery, spicy wines, you may not love them as much as I did. They are just fine on their own, no food necessary. 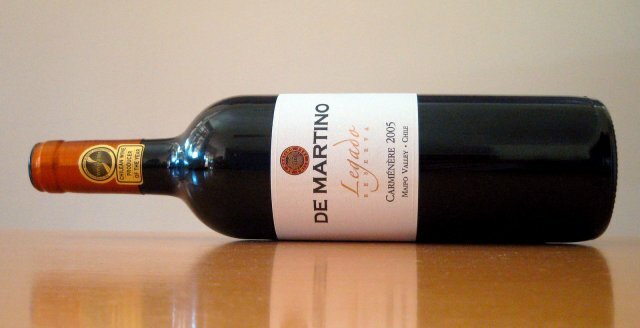 2008 De Martino Organico Cabernet Sauvignon – Malbec – Extremely interesting and bold nose. Bell pepper, smoke, dark fruit, dirt, cranberry… fruit really comes out on the midpalate and I absolutely loved that it lingered at the end and the tannins didn’t dry out my mouth. But it didn’t just taste like fruit juice either, the tannins are there but the fruit is still coming out. This is a very well made wine that is drinking beautifully right now! I wouldn’t age it much longer… $14.99/bottle Triple, possibly stealing home!